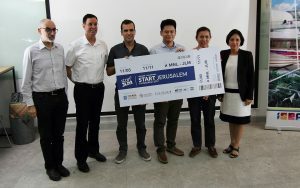 Manila- EdTech startup based in Cagayan de Oro City, Wela School Systems won the Pitch Jerusalem competition which will take its representative to Israel to join other founders from around the globe for the Start Jerusalem event. Wela School Systems will take part in a five-day innovation experience with workshops and sessions designed to take their startup to the next level. From L-R: David Elefant, VP for External Relations ICCP; Sagiv Massad, Director, ICCP; Itamar Gero, President, ICCP; John Vincent Fiel, Co-Founder of Wela School Systems; Cherry Murillon of Wela School Systems and Dr. Leah Buendia, Assistant Secretary for International Cooperation, Department of Science and Technology. Wela School Systems is an EdTech Startup that is operating more than 2 years. The startup is currently serving 8 private schools in Cagayan de Oro City and is currently scaling in Luzon. Their flagship product is a cloud based grading platform that improves faculty productivity by 90% by automating their academic reports and lessening spreadsheets to make by 75%. Wela School Systems bundle this product with their RFID stations which upon tap of their ID, the technology is able to send a notification to the mobile application of their parents that they are in school. Their parent’s mobile application is able to track student’s attendance, student’s homework, academic grades, read school feeds from the school, and receive announcements from the school. Wela School System representative will receive a full travel package including roundtrip airfare, hotel accommodation and access to the Start Jerusalem event. 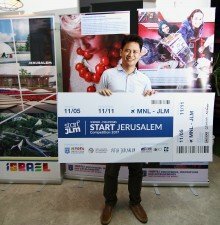 “Israel has innovation and creativity in its DNA and it is our mission to share this here and help to cultivate the startup environment.” said Itamar Gero, President of Israel Chamber of Commerce of the Philippines. Pitch Jerusalem winner- John Vincent Fiel, Co-Founder of Wela School Systems. A total of 30 startups submitted their applications in the competition. Five of them were invited to present to a panel of judges composed of: Itamar Gero, President, Israel Chamber of Commerce of the Philippines; David Elefant, VP for External Affairs of ICCP, Sagiv Massad, Director of ICCP and Dr. Leah Buendia, Assistant Secretary for International Cooperation, Department of Science and Technology. Embassy of Israel Deputy Consul General, Yulia Rachinsky-Spivakov also graced the event. The pitch competition is presented by the Israel Chamber of Commerce of the Philippines and the Embassy of Israel in the Philippines in cooperation with the Department of Trade and Industry Export Marketing Bureau, Department of Science and Technology and Qbo Innovation Hub and ICCP Platinum Sponsor, Dayanan Business Consultancy and Event Sponsors TrueLogic Online Solutions and Payoneer.